Proving (we guess) that ice anchor desks really are an all-year-round thing, Portland ABC affiliate KATU-TV built an ice anchor desk to show viewers just how hot it is. As you may recall, the country was swept by an ice anchor desk craze during the “polar vortex” this past winter. That trend even lead to an ice chroma key wall. Those desks were, of course, meant to show just how cold it was — but KATU-TV has taken a 180 on that idea and is using it tout the near-90s the city is experiencing. Meanwhile, in Raleigh, WRAL-TV opted to create a sand anchor desk earlier this summer. 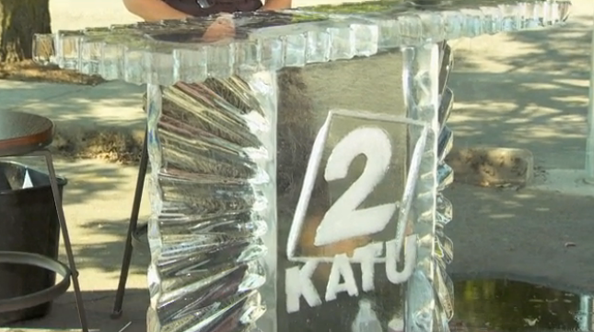 KATU-TV anchored its afternoon and evening newscast from behind the outdoor ice creation, which was carved by Portland-based ice sculptor James Stugart (the obligatory “it wasn’t easy” video clip is below).